Save Up to 50% on the cost of your business printing costs by using ink cartridge & toner printer cartridge refills from Cartridge Care Manchester – 0161 738 1465. 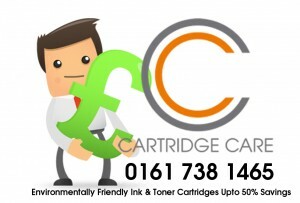 Cartridge Care Manchester are suppliers of high quality, low cost inkjet and laser toner printer cartridges. We provide a huge range of Printer Cartridges, Toner Cartridges & Ink Cartridges In Manchester. Using our printer ink & toner refills you can benefit from huge savings compared to the leading manufacturer printer cartridges without compromising on quality. Cartridge Care Manchester – we deal with every major brand of printer cartridge and we’re so confident your Cartridge Care printer cartridges will be as good as the original manufacturers’ that we offer a 100% money back guarantee if you aren’t completely satisfied. Cartridge Care – We can deliver your printer cartridges, toner cartridges, ink cartridges, compatible cartridges, refilled cartridges, toner refills, printer ink refills, refilled toners in Manchester – Free delivery to businesses and households In Salford, Bolton, Stockport, Manchester, Radcliffe, Tottington, Ainsworth, Prestwich, Cheetham Hill, Trafford Park, Whitefield, Bury, Heywood, Oldham, Audenshaw. Laser Toner Cartridges Manchester & Printer Ink Cartridge Refills Manchester – Free Delivery. This entry was tagged Brother Ink Cartridges Manchester, Brother Printer Cartridges, Cartridge Refill Manchester, Cartridges Manchester, Compatible Ink Cartridges Manchester, compatible toner cartridges Manchester, Epson Ink Cartridges Manchester, HP Ink Cartridges Manchester, HP Toner Refills Manchester, ink cartridge suppliers manchester, Ink Cartridges Manchester, Manchester, printer cartridge suppliers manchester, Printer Cartridges Manchester, Printer Ink Bolton, Printer Ink Bury, Printer Ink Manchester, Printer Ink Radcliffe, Printer Ink Salford, Printer Ink Trafford Park, refill ink manchester, samsung toner cartridges, toner cartridge suppliers manchester. Bookmark the permalink.